For the baseball player, see Jerome Williams (baseball). He was a star player on the Magruder High School basketball team. 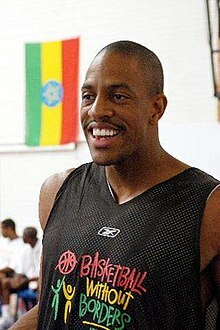 Drafted out of Georgetown University by the Detroit Pistons with the 26th pick of the 1996 NBA Draft (the pick originally belonged to the San Antonio Spurs and went to the Pistons in the Dennis Rodman trade), he played four-plus years with the Pistons, becoming one of their key reserves. He was a fan favorite during his days playing for the Toronto Raptors due to his tenacious efforts on the court. On February 22, 2001 Williams was traded from the Detroit Pistons, along with Eric Montross, to the Toronto Raptors in exchange for Corliss Williamson, Tyrone Corbin, Dávid Kornél and a future first-round draft pick. He was so enthusiastic about joining his new teammates that he immediately drove from Detroit to Toronto upon hearing the news. In 2002-03 with the Raptors, Williams averaged 9.7 points per game, primarily as a starter, which has thus far been his career-best scoring average. In 2003, Williams also made a cameo appearance in the Disney Channel Original Movie, Full-Court Miracle. In December 2003 Williams was traded again, this time along with Antonio Davis and Chris Jefferies, to the Chicago Bulls for Jalen Rose, Donyell Marshall and Lonny Baxter. Overall in 2003-04, Williams played in 68 games, starting 44 of them, averaging 6.2 points and 7.0 rebounds per game. During the 2004 offseason, he was involved in yet another trade, one that sent him and Jamal Crawford to the New York Knicks for Dikembe Mutombo, Frank Williams, Othella Harrington and Cezary Trybanski. His relocation to New York meant a relegation to the bench, as his minutes dropped down to around 17 a game. On August 15, 2005, Williams was waived by the Knicks to avoid luxury taxes on his salary, as part of the NBA's new labor agreement. He announced his retirement from his playing career less than 48 hours later. Williams played in 587 games over nine seasons, averaging 6.6 points and 6.4 rebounds per game. Williams joined the NBA's "Basketball Without Borders" program, an effort to teach the game and bring resources to underdeveloped nations in Africa, Asia and elsewhere. In Toronto, he was always greeted with a standing ovation when he returned in a Bulls or Knicks uniform. Nicknamed the Junk Yard Dog (or JYD) by Rick Mahorn in his early days as a Detroit Piston for his hard work and hustle (as stated in an interview while he served as a commentator on NBA TV), Williams sometimes referred to himself in the third person. On January 25, 2006, Williams rejoined the Toronto Raptors as their community representative. Williams also played a minor role in the Canadian FBI show, Sue Thomas: F.B. Eye. He played Otis Washington, a dealer turned informant. Williams was hired as Director of Player Development for the national champion Findlay Prep basketball team before becoming assistant coach. In the summer of 2013, Jerome was promoted to the position of Head Coach at Findlay Prep. He stepped down as head coach in the summer of 2014. Williams continues to be a part of youth development through basketball as he was appointed the President of The Young3 which holds 3-on-3 tournaments for young people ages 9–14.